Celebrate 20 years of Harry Potter magic! 'There will be three tasks, spaced throughout the school year, and they will test the champions in many different ways . their magical prowess - their daring - their powers of deduction - and, of course, their ability to cope with danger.' The Triwizard Tournament is to be held at Hogwarts. Only wizards who are over seventeen are allowed to enter - but that doesn't stop Harry dreaming that he will win the competition. Then at Hallowe'en, when the Goblet of Fire makes its selection, Harry is amazed to find his name is one of those that the magical cup picks out. He will face death-defying tasks, dragons and Dark wizards, but with the help of his best friends, Ron and Hermione, he might just make it through - alive! 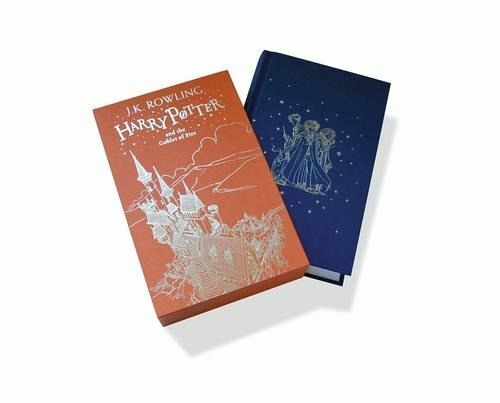 This gift edition hardback, presented in a beautiful foiled slipcase decorated with brand new line art by Jonny Duddle, will delight readers as they cheer Harry on through his fourth year at Hogwarts School of Witchcraft and Wizardry.